Renewing the Support & Upgrade subscription will give access to cloud processing (depending on the license), technical support as well as new versions of Pix4D Desktop as they are released. If the Support and Upgrade has expired or is about to expire, it is possible to renew it from the Pix4D Cloud page. Log in with the credentials of the account with the license. 1. In the cloud home page, in the License Expired message banner, click MANAGE LICENSES. 2. On the panel of the license with expired Support & Upgrade, click Buy now to renew. 1. On the left sidebar of the cloud home page, click the account name. 3. 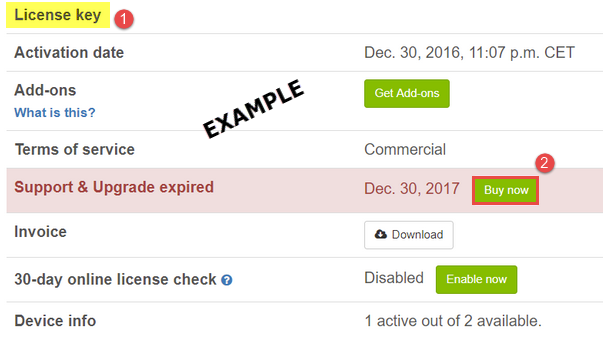 Go to the panel of the active license, and next to Support & Upgrade, click Extend now.